Late Night Tuff Guy is Carmelo Bianchetti (aka Cam aka HMC aka LNTG), who, under his HMC (House Master Cam) DJ guise, is revered as one of Australia’s House and Techno pioneers. Dubbed by DJ Magazine as ‘the godfather of the Adelaide scene’, in the ’90s he played dates in Asia and Europe, but an aversion to flying unfortunately put an end to any international aspirations. However, via his Late Nite Tuff Guy edits, he’s now connecting with a new audience of people around the globe, and my bet is that he’s about to blow up in a big way, the quality and consistency of his work currently placing him at the cutting-edge of this ever-growing edits movement. He’s also somewhat prolific, with 5 releases in less than 12 months, a 6th imminent, and a 7th already lined up! 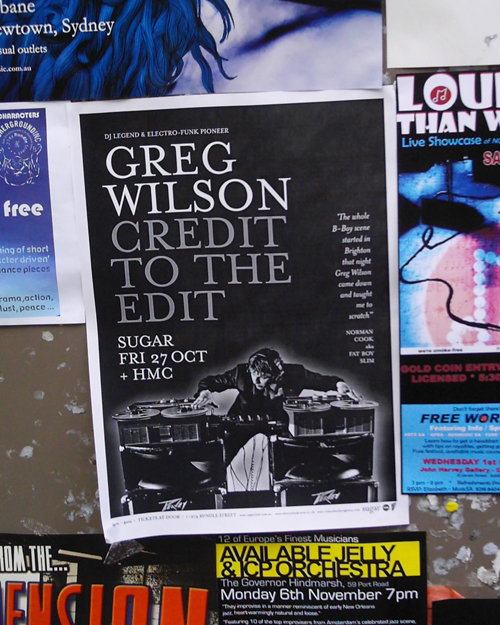 I met Cam / HMC in October ’05, when I played at Sugar, my regular stop in Adelaide, for the first time. Since then I’ve come to realise that DJs all over Australia hold him in high regard, as somebody who blazed a trail back in the day, and continues to do things on his own terms. So it’s really good to see him receive some long overdue recognition outside of his home country. Anyhow, back to May of last year when Driller, the owner of Sugar, sent me an email telling me he’d set up a record label, Dessert Island Discs, and linking me to the inaugural release. This was the first time I heard ‘One Nite In A Disco’, and it really grabbed my attention in a big way. The intro was mesmerising, with ‘one nite in a disco…in a disco…in a disco…in a disco’ rhythmically repeating over and over. 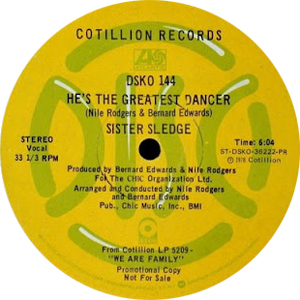 Even though it was moulded from a well-known track, Sister Sledge’s ‘He’s The Greatest Dancer’, it wasn’t obvious – that was until after the 8th measure of vocal, when the next line in the song, ‘on the outskirts of Frisco’, burst in and changed the whole vibe for me, abruptly snapping me out of my disco trance. I was disappointed to hear this line for two reasons. Firstly, I’ve always felt, as I know many others do, that some of the lyrics in ‘He’s The Greatest Dancer’ are, shall we say, a tad corny – the rhyming of ‘Disco’ and ‘Frisco’ the prime example. For this reason I’ve never played the original version since I started deejaying again – the Rodgers / Edwards groove is, of course, sublime, the Chic Organization really on a roll at the time, but I can’t get past those lyrics. I remember hearing Danny Wang play it in Liverpool back in 2004 and it sounded great, but Danny can get away with stuff like that – it just didn’t sit right for me personally. However, even more important to me was that the line fixes the song in a definite place, whereas I could see the possibility of an edit that would make the track’s location neutral, so that when people are dancing to it the ‘one nite in a disco’ that the words are referring to isn’t somewhere else (anchored to ‘Frisco’ in this case), but here and now, in whichever disco you happen to be in, regardless of where you are. I wanted to make the track universal, so, when I play it, it speaks to that particular ‘nite’, the one we’re experiencing. So I tailored an edit for my own needs, focusing the track’s hypnotic vibe by removing the offending lyrics (annoying would be a better word – I could never be offended by a Rodgers / Edwards song), whilst extending the groove that had hooked me like an opiate. The Daz Digs Disco edit of ‘Greatest Dancer’ would become a massive tune for me, and appears in a number of my online mixes. Interestingly I was playing it the following month in Osaka, Japan, when who should come up to me to say hello, but Danny Wang, who unbeknown to me at the time, was appearing at another club in the city later that night. Definitely some karmic forces at work, taking things full circle from when I heard him dig out the original 7 years previous in that Liverpool basement. 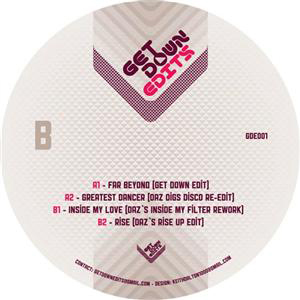 I tipped off a couple of the people I know who release edits, and this resulted in Daz’s edit being issued last July on limited vinyl, along with three of his other reworks, as ‘Get Down Edits Vol 1’. Daz was always very gracious about the support I’d given it, but really it’s a two way street and I’m obviously thankful that he put together something that fitted so well into what I do (which is the case with all DJ’s who thank me for playing their edits, when they’re the ones who are deserving of the real thanks for doing them in the first place). 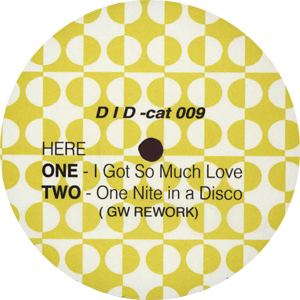 So finally, here are the 2 versions of ‘One Nite In A Disco’, the first being the original, followed by my rework. I’m sure there are plenty of people who, unlike me, love the cheesy lyrics, and see me as a bit of a killjoy for taking them out, but, by the same token, there are plenty of others who’ll thank me for sparing them the cringe factor. Both versions work in their own context, but, from a personal perspective, it’s a deeper track for the loss of those words – something that gets into your bones, and not on your nerves. That’s what it is with an edit, you’re coming at it from your own angle – the blade cutting diagonally. I can live with the cheesiness of the lyrics on the original version but on the LNTG edit the “outskirts of frisco” line really sticks out like a sore thumb. The edit builds up such an amazing groove and then drops the track flat on its face. It’s so sad. Anyway, Mr Wilson you’ve rescued it and taken it to the next dimension. One of my highlights of last year was dancing to your edit: the dancefloor really did take off! A great example of the power of editing. A track that I would have never listened to again because I found one 2 second burst offensive, is now one that I can’t get enough of. Thankyou. Well, that’s the beauty of an edit. It’s non-destructive; you can play your edit out in the club for your own sets, and fans of the original can still enjoy the annoying hook of the original at home, or wherever that sort of thing is played. I’d consider myself to be a real connoisseur of “cheese”, so for me, that last piece “on the outskirts of Frisco” really ties the whole track together. I enjoy your edit Greg, but when I listen to it, I almost instinctively wait for that last piece which never comes. That can also be a good thing, as I hear many DJs who do that purposely in their sets, but I’ll be honest – I find it a little aggravating, and a let down when I don’t hear it and the song ends. That’s not meant to be offensive. As a DJ, you’re setting the atmosphere and you have the right (or should I say the duty) to be very picky about every last detail of a song. Your edit has a much more contemporary sound and worked very well when I heard you play it last month. A Greg Wilson set is going to be very different from a LNTG set, or my own set, and that’s good because otherwise I’d get very tired of hearing the same thing over and over. To that end, if you didn’t find Sister Sledge to be offensive, I’m sure that if you’d heard some of my edits you’d certainly be repulsed – It’s like a French construction worker; a little rough, crude, and packed full of cheese! I think it’s really fantastic that we can listen to the same song and be inspired by it in very different ways. This is the reason that I can go back to the black music of the 60s and so can the Beatles and the Stones and so many other artists, but we come out and produce new material which is seemingly unrelated. So keep making those edits. I’ll keep listening. Very interesting to find out some more on LNTG. His output is fantastic in terms of choice of tune and the edit. My only gripe is that he doesn’t release more. Id pay top dollar for his take on Funkin for Jamaica – my favourite tune of the last year. My feelings about this edit are well documented with you Greg. However, having read this and the comments above I feel that I should explain further why for me I think the rework can, and really ought to be this Summer’s big dance floor shaker . The “keep you guessing” nature of the rework is what makes it for me. I think, unknowingly this is the same for so many others who can’t help but jump aboard knowing that this ride is headed somewhere good but not knowing where, exactly, yet prepared to simply go for the jaunt while remaining content in never actually discovering the final destination. That, I believe, is what makes this work so well in today’s overcrowded, over hyped and overly obvious music scene. The LNTG and GW collaboration deserves a great many plaudits and even more airtime. When I started doing re-edits some 15 odd years ago I was lucky to work with Kevin Brooks who Dave Lee’s old studio engineer which was an absolute blessing. My first release with Kev was Barbara Roy’s – If You Want Me; the 1981 original was a lovely tune & perfect for a disco / HMD/ loft style set but too slow & without the 4/4 bass drum for any house dj to want to play it; well after delivering by a hand a copy to Danny Rampling he very kindly played it on Radio 1 so I must have got something right! My intention was simply to repackage the original in a dj friendly format which was faithful to the original. But! & this is the most important point above all is you have to come up with a whole new idea & its that idea which ultimately your re-edit will be judged on. You can’t simply just sample something classic without bringing something new to the table. Thanks for kind words Jonnie, and good to have your contribution. One thing though, as much as I’d like to, I can’t take credit for the ‘Lovers Holiday’ edit, props due to Late Nite Tuff Guy for that one. Indeed as you say Greg full props to LNTG! Great piece of writing again Greg. Love that edit, I was at Bestival in 2011 when you dropped that and it went off. That was an incredible night of music. Having followed the edits scene for many years it’s always interesting to get a bit more insight in to what goes into them. Also, I didn’t realise HMC was Late Night Tuff Guy, I remembered him from ‘Phreakin’ in ’95! Jonnie – I was there when you sold a few copies of your ‘100% Polyester Vol. 1’ to Blackmarket Records all those years ago, I piped up that I liked it and you gave me a free copy! What a gent. Figure I still owe you a beer for that!